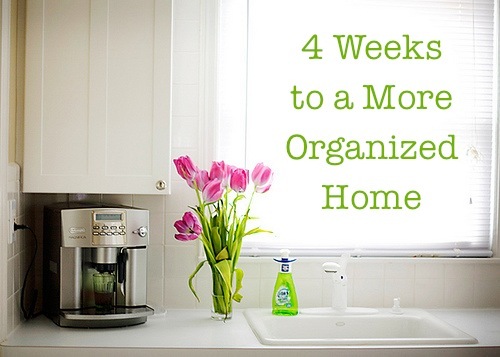 ::Set the timer for 15 minutes and clean the mirrors and glass doors in your house. ::Clean out your utensil drawer(s) (those with serving spoons, ladles, spatulas, etc.) in the kitchen and your junk drawer(s). Take everything out, throw out the trash, get rid of extra clutter, wipe out the drawers, and re-organize the contents as you put them back in. At around 9 p.m. EST tonight, I’ll be posting my progress and pictures, along with a link-up for you to share your progress and pictures, too. Here’s to our productivity today! I feel like you know exactly what I was trying to hide …. my junk drawer! I did this with the silverware drawer. Guess i will stop putting off the inside of the fridge!! Skipped that day. Yuck . That was easy! I have been cleaning out my utensil and junk drawers a couple of times a month since January! My husband is applying for teaching jobs all over and we have no idea when or where we will have to move. I’m due with our fourth in June, and I know from experience that energy will be at a premium, so I am trying to prepare as much as possible between now and then! Wow, I have been staying ahead for some very odd reason. Thank you for choosing things that I have recently done (why I did it, I have no idea). I am honestly surprised at my excitement for cleaning these days! My husband eagerly asks each day when he gets home, “What did she ask you to clean today? ?” Happy Hubby, Happy Home. 🙂 Thank you!! Wish I was at your conference so I could give you a big hug!! I’m SO glad that this is motivating you and something you’re enjoying. Hopefully we’ll get to meet in person sometime soon! We have so many junk drawers in my house:( Honestly, I don’t know what to do about them! We also have lots of junk cupboards and cabinets….You’d think with all the hidden space we have there would be nothing on the counters….not so much!! My husband just walked into the room a bit ago and asked “could you get Money Saving Mom to assign window cleaning?” he is loving the results of this series, and so am I. My junk drawers are not in my kitchen and mostly my husbands small tools, but I will brave them, and my utensil drawer too! I read it and thought that is the worst job! So I did it right away and now I am happy it is done! Thank you for the motivation. Aww….that’s not too scary. I have our junk drawer organized with tupperware containers….pens are in one, cell chargers in an another etc….. It really has helped it to not be a huge mess. P.S I love that you’re doing this challenge series! I can’t believe how focused I’ve been with cleaning since I started the challenge with you! We were practically out the door last night to go to a school function and I made them wait so I could finish the bathroom. That is so not typical of me! I love it and I love the results. I just emailed my husband the assignment today to see if he wanted doors or junk drawer… we’ve been sort of tag teaming the jobs. Love it!! I love that you’re tag-teaming with your husband. How fun! Thank you so much for this series!! I’ve had motivation to do above and beyond and even cleaned out my entire laundry room yesterday – cupboards and all – no small feat in this house! I already did my junk drawer the other day. I did some of the utensils when I did my silverware drawer but I have one drawer with all my measuring cups and spoons along with a few other odds an ends. So I will get that drawer cleaned up today. Our windows do need some cleaning too so I will get to that today. I still have out my steam cleaner so maybe I will use that it works so well on windows. Now if only it wasn’t raining so I could do the outside of the windows too. Well that will have to wait for another day. If I wasn’t working full time I would definitely be doing this! I have been printing them out and saving them so when I do start I have it all down. I did start the 15 min timer with my kids and I and that is wonderful! Thank you!! A few months ago I took everything out of the “scary drawer” as we call it, put it all in a rubbermaid and put it in the back porch. Since then I have been taking a untensil here and there out and adding it back to the drawer. In June, whatever is left is going away: rummage sale, St Vinnies, trash etc. There are so many weird things that I never use. I bet there are still 20 items in the back porch. Ah, the junk drawer, I can hardly get it closed so it does need doing! Glass doors is a tall order in this house! We have many, many French doors and what a pain it is to keep them all clean! I’m going to skip the silverware drawer, since I have a toddler that uses it to keep himself occupied while Mom’s making supper. (The sharp stuff is in another kitchen drawer.) He’s happy as can be with straws and measuring spoons, etc, and that is worth the trade-off for a messy silverware drawer! The junk drawer on the other hand, sometimes doesn’t shut…..
You wouldn’t believe the neat stuff I’m finding in my house! Yay! Great job! (And I’m going to be answering your emails when we get back from the conference we’re at this weekend. Phew. I cringed when I saw the junk drawer on the list (even though I hoped it would be on this list since it had gotten out of control), and I thought there was no way I could get both that and the baking drawer finished in one day…but 1/2 an hour later, I was done. I was actually ruthless and tossed many things I don’t use anymore. So happy things are getting in shape for spring! I just moved my junk drawer to my pantry. I used a shoe organizer on the door and then placed all the items in categories: tape, batteries, ziploc bags ect. into each pocket and I worked well. Now I have a free drawer in the kitchen yay! Thanks for keeping us motivated Crystal! I’m far, far behind and catching up with this… I noticed per the links at the bottom that there is no Day 15. Where can I find that?